For for the 365 California, GT 2+2, GTC, and GTS, see Ferrari 365. The Ferrari Daytona, officially designated the Ferrari 365 GTB/4, is a two-seat grand tourer produced by Ferrari from 1968 to 1973. It was introduced at the Paris Auto Salon in 1968 to replace the 275 GTB/4, and featured the 275's Colombo V12 bored out to 4,390 cc (4.4 L; 267.9 cu in). The Daytona was succeeded by the mid-engined 365 GT4 Berlinetta Boxer in 1973. The unofficial Daytona name is reported to have been applied by the media rather than Ferrari and commemorates Ferrari's 1-2-3 finish in the February 1967 24 Hours of Daytona with a 330 P3/4, a 330 P4 and a 412 P. To this day, Ferrari itself only rarely refers to the 365 as the "Daytona", and refer to it as an "unofficial" name. Unlike Lamborghini's then-new, mid-engined Miura, the Daytona was a traditional front-engined, rear-drive car. 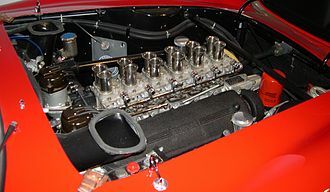 The engine, known as the Tipo 251 and developed from the earlier Colombo V12 with a 60° bank angle used in the 275 GTB/4, was a DOHC 2 valves per cylinder 4,390 cc (4.4 L; 267.9 cu in) , 365 cc (22.3 cu in) per cylinder, bore x stroke 81 mm × 71 mm (3.19 in × 2.80 in), featuring 6X2 barrel 40 DCN/20 Weber carburetors (40 mm Solex twin carburettors were used alternatively). At a compression ratio of 9.3:1, it produced 259 kW (352 PS; 347 hp) @ 7500 rpm and a maximum torque of 431 N⋅m; 318 lbf⋅ft (44 kg⋅m) @ 5500 rpm, could reach 280 km/h (174 mph). 0-60 mph (97 km/h) acceleration was just 5.4 seconds. For the American version, slight modifications were made - the compression ratio was reduced to 8.8:1 and the exhaust system was equipped with a large central silencer, necessitating visible alterations to the primary pipes. 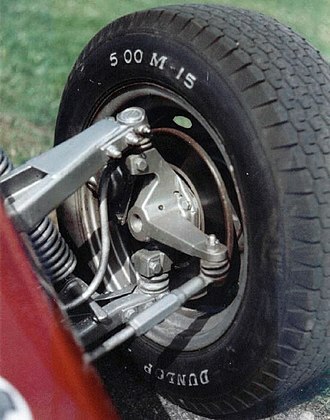 The five-speed manual transmission (of the transaxle concept) was mounted in the rear for optimal weight distribution, and a four-wheel independent suspension featured wishbones and coil springs. Although a Pininfarina design, as with many previous Ferrari road cars styled by Leonardo Fioravanti, the 365 GTB/4 was radically different, replacing the traditional rounded design with much more sharp-edged styling. Early Daytonas featured fixed headlights behind an acrylic glass cover. A new U.S. safety regulation banning headlights behind covers resulted in retractable pop-up twin headlights in 1971. The generally accepted total number of Daytonas from the Ferrari club historians is 1,406 over the life of the model. 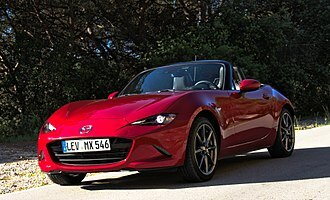 This figure includes 156 UK right-hand-drive coupés, 122 factory-made spyders (of which 7 are right hand drive), and 15 competition cars. The competition cars are divided into three series, all with modified lightweight bodies and in various degrees of engine tune. 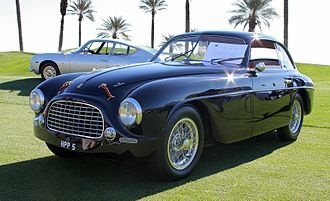 All bodies except the first Pininfarina prototype were produced by Italian coachbuilder Scaglietti, which already had a well established record of working with Ferrari. Historically, and especially since the mid-1980s and early 1990s, there has mostly been a considerable market price difference between a real berlinetta and a real spyder. 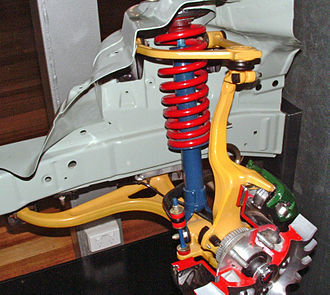 Many berlinettas were turned into spyders by aftermarket mechanics, often to increase the car's monetary value or simply because of the owner's preference for an open car. Differences in value have typically remained, however, even after the most skillful conversions. The first racing version of the 365GTB/4 was prepared in 1969: an aluminium bodied car was built and entered in the Le Mans 24-hour race that year (the car crashed in practice). 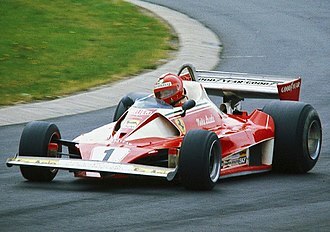 Ferrari did not produce an official competition car until late in 1970. The official cars were built in three batches of five cars each, in 1970-1, 1972 and 1973. They all featured a lightweight body making use of aluminium and fibreglass panels, with plexiglas windows. The engine was unchanged from the road car in the first batch of competition cars, but tuned in the latter two batches (to 400 bhp (298 kW; 406 PS) in 1972 and then around 450 bhp (336 kW; 456 PS) in 1973). The cars were not raced by the official Scuderia Ferrari team, but by a range of private entrants. They enjoyed particular success in the 24 Hours of Le Mans, with results including a 5th overall in 1971, followed by GT class wins in 1972, 1973 and 1974. In 1972 Ferrari 365 GTB/4s took the first 5 places of the GT class. The final major success of the car was in 1979 (five years after production ended), when a 1973 car achieved a class victory (2nd overall) in the 24 Hours of Daytona. In 1971, the Daytona gained fame when one was driven by Dan Gurney and Brock Yates in the inaugural Cannonball Baker Sea-To-Shining-Sea Memorial Trophy Dash. Showcasing the car's potential for sustained high speed travel, the pair won with an average speed of 80.1 miles per hour (129 km/h), completing the distance from New York City to L.A. - 2,876 miles (4,628 km) - in 35 hours 54 minutes. Gurney was later quoted as saying "We never once exceeded 175 miles per hour." It appears on the cover of 1973's Now & Then, the fifth studio album of the American pop band The Carpenters. In the 1980s, a Daytona was prominently featured on the first two seasons of NBC's hit television series Miami Vice. The black car seen in early episodes was a replica built on a Corvette C3 chassis. Altogether, two nearly identical cars were used simultaneously in the production of the TV series. Ferrari execs were not pleased that their company and one of their products was represented on TV by an imitation car and sued the manufacturer of the kit for trademark infringement and trademark dilution. 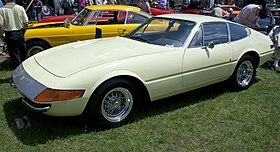 The Daytona replicas were retired at the beginning of the show's third season and replaced by two Ferrari-donated Testarossas, the company's newest flagship model at the time. In 2004, the Daytona was voted top sports car of the 1970s by Sports Car International magazine. Similarly, Motor Trend Classic named the 365 GTB/4 and GTS/4 as number two in their list of the ten "Greatest Ferraris of all time". Wikimedia Commons has media related to Ferrari 365 GTB/4 "Daytona". ^ "Designer". ajovalo.net. Retrieved 8 February 2012. ^ a b c d e f "Ferrari 365 GTB4". Ferrari GT - en-EN. Retrieved 2016-01-11. ^ "365 GTB4". Official Ferrari website. Ferrari. Retrieved 21 February 2014. ^ "WSPR, World Championship 1967". wspr.ic.cz. Retrieved 30 December 2014. ^ "Ferrari.com". Official Ferrari Website. 25 February 2017. ^ a b Willson, Quentin (1995). The Ultimate Classic Car Book. DK Publishing, Inc. ISBN 0-7894-0159-2. ^ Ahlgrim, Steve (June 2014). "Amelia Island 1972 Ferrari 365 GTB/4 Daytonas". Sports Car Market. 26 (6): 67. ^ Lamm, John (2008). Exotic cars. MBI Publishing company. p. 25. ISBN 978-0-7603-3261-0. ^ Braden, Pat; Roush, Gerald (1982). The Ferrari 365GTB/4 Daytona. Osprey. ISBN 978-0850454123. ^ "Miami Vice Daytona Found". Jim Suva's Blog. Retrieved 2016-03-15. Pininfarina S. p. A. is an Italian car design firm and coachbuilder in Cambiano, Italy. It was founded by Battista Pinin Farina in 1930. On December 14,2015, Mahindra Group, Pininfarina is employed by a wide variety of automobile manufactures to design vehicles. Since the 1980s Pininfarina has designed high-speed trains, trams, rolling stocks, automated light rail cars, people movers, airplanes, with the 1986 creation of Pininfarina Extra they have consulted on industrial design, interior design and graphic design. Pininfarina was run by Battistas son Sergio Pininfarina until 2001, his grandson Andrea Pininfarina until his death in 2008, after Andreas death his younger brother Paolo Pininfarina was appointed as CEO. At its height in 2006 the Pininfarina Group employed 2,768 with subsidiary company offices throughout Europe, as well as in Morocco, as of 2012 with the end of series automotive production, employment has shrunk to 821. Pininfarina is registered and publicly traded on the Borsa Italiana, on December 14,2015, Mahindra Group, announced a deal to acquire Pininfarina S. p. A. in a deal worth about 168 million euros. That first year the firm employed eighteen and built 50 automobile bodies, on May 22,1930 papers were filed to become a corporation, Società anonima Carrozzeria Pinin Farina headquartered in Turin, Italy, at 107 Corso Trapani. During the 1930s, the company built bodies for Lancia, Alfa Romeo, Isotta-Fraschini, Hispano Suiza, Fiat and this development happened in the mid-1930s when others saw the frameless construction as the end of the independent coachbilder. In 1939, World War II ended automobile production, but the company had 400 employees building 150 bodies a month, the war effort against the Allies brought work making ambulances and searchlight carriages. The Pininfarina factory was destroyed by Allied bombers ending the firms operations, after the war, Italy was banned from the 1946 Paris Motor Show. The Paris show was attended by 809,000 visitors, lines of people stretched from the gate all the way to the Seine. The managers of the Grand Palais said of the display, the devil Pininfarina, but to the press, at the end of 1945 the Cisitalia 202 Coupé was designed. An exhaust system is usually piping used to guide reaction exhaust gases away from a controlled combustion inside an engine or stove. The entire system conveys burnt gases from the engine and includes one or more exhaust pipes, depending on the overall system design, the exhaust gas may flow through one or more of, Cylinder head and exhaust manifold A turbocharger to increase engine power. A catalytic converter to reduce air pollution, a muffler / silencer, to reduce noise. An exhaust pipe must be designed to carry toxic and/or noxious gases away from the users of the machine. Also, the gases from most types of machines are hot, the pipe must be heat-resistant. 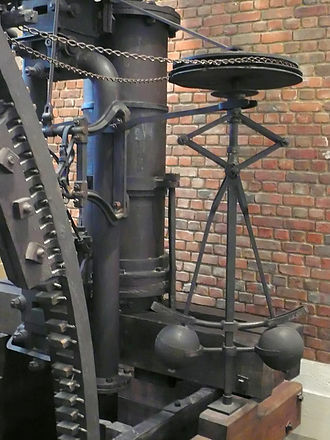 A chimney serves as an exhaust pipe in a stationary structure, for the internal combustion engine it is important to have the exhaust system tuned for optimal efficiency. Also this should meet the regulation norms maintained in each country, in China, China 5, In European countries, EURO5, In India, BS-4, etc. In most motorcycles all or most of the exhaust system is visible, aftermarket exhausts may be made from steel, titanium, or carbon fiber. Motorcycle exhausts come in many varieties depending on the type of engine, a twin cylinder may flow its exhaust into separate exhaust sections, such as seen in the Kawasaki EX250. Or, they may flow into a single exhaust section known as a two-into-one, larger engines that come with 4 cylinders, such as Japanese super-sport or super-bikes often come with a twin exhaust system. 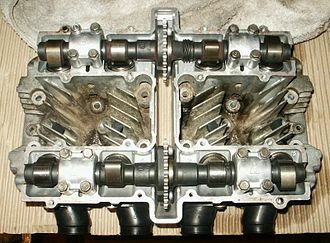 A full system may be bought as an accessory, called a 4-2-1 or 4-1. In the past, these bikes would come standard with a single exhaust, however, EU noise and pollution regulations have generally stopped this practice, forcing companies to use other methods to increase performance of the motorcycle. A 2-stroke exhaust can be made to be quieter than 70dBa at 6000 rpm without sacrificing any power gains, the nature of the beast is that a 4T exhaust note above 6000 rpm is unduly harsh to the human ear. In many trucks / lorries all or most of the exhaust system is visible, often in such trucks the silencer is surrounded by a perforated metal sheath to avoid people getting burnt touching the hot silencer. A muffler is a device for decreasing the amount of noise emitted by the exhaust of an internal combustion engine. The US Patent for an ‘Exhaust muffler for engines’ was awarded to Milton O. Reeves and Marshall T. Reeves of Columbus, US Patent Office application №582485 states that they “have invented certain new and useful Improvements in Exhaust-Mufflers for engines”. Mufflers are installed within the exhaust system of most internal combustion engines, the muffler is engineered as an acoustic soundproofing device designed to reduce the loudness of the sound pressure created by the engine by way of acoustic quieting. An unavoidable side effect of use is an increase of back pressure which decreases engine efficiency. 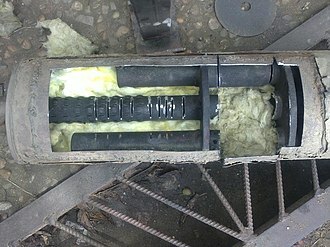 This is because the engine exhaust must share the same complex exit pathway built inside the muffler as the pressure that the muffler is designed to mitigate. When the flow of exhaust gases from the engine to the atmosphere is obstructed to any degree, back pressure arises and the engines efficiency, performance-oriented mufflers and exhaust systems thus strive to minimize back pressure by employing numerous technologies and methods to attenuate the sound. The Ferrari P series were sports prototype racing cars produced in the 1960s and early 1970s. Sports car racers followed in 1963, although these cars shared their numerical designations with road models, they were almost entirely dissimilar. The first Ferrari mid-engine in a car did not arrive until the 1967 Dino. The 250 P was a Prototype racer produced in 1963, winning the 12 Hours of Sebring,1000 km Nürburgring and it was an open cockpit mid-engined design with a single-cam 3. 0-litre 250 Testa Rossa V12 engine and was almost entirely unrelated to the other 250 cars. The 275 P and 330 P were evolutions of the 250 P with longer wheelbase and 3. 3-litre or 4. 0-litre engines and these cars raced during 1963 and 1964. The 250 P evolved into a saleable mid-engined racer for the public, introduced at Paris in November,1963, the LM was successful for privately entered racers around the world. This car is on display at the Indianapolis Motor Speedway Hall of Fame Museum. About 32 models were built in 1964 and 1965, with all but the first few powered by 3. 3-litre 320 hp engines, a fully independent double wishbone suspension was specified with rack and pinion steering and four wheel disc brakes. The 250 LM thus had to run as a Prototype until it was homologated as a Group 4 Sports Car for the 1966 season, a 1964 Ferrari 250 LM was auctioned off by Sothebys in 2013 for a price of $14.3 million to an undisclosed telephone bidder. This bidding smashed the previous record for this model. Two entirely new cars, the 275 P2 and 330 P2, the 330 P2 was first used by Luigi Chinettis North American Racing Team in the Daytona race that year. In 1965275 P20836 won the 1000 km of Monza,275 P20828 won the Targa Florio,330 P20828 won the Nurburgring 1000 km, the P2 cars were replaced by the P3 for 1966. For 1965 Ferrari built a version of P2 cars, they were equipped with a SOHC4.4 L engine. In 1966 Ferrari upgraded their 365 P2 cars with new bodywork by Piero Drogo, the 1966330 P3 introduced fuel injection to the Ferrari stable. It used a P3 transmission whose gears were prone to failure and were replaced by ZF transmission gears and other internals. 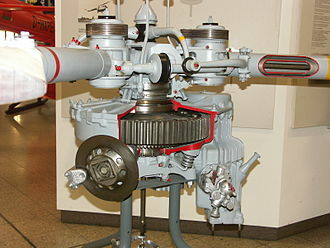 When P30844 and 0848 were first converted to 412 Ps this 593 with ZF internals was fitted for one season after which the 593s with ZF internals were replaced by 603 transmissions in all the 412 Ps. It is run on a 3. 56-mile combined road course, utilizing portions of the NASCAR tri-oval and an infield road course. Since its inception, it has held the last weekend of January or first weekend of February, part of Speedweeks. It is the first race of the season for the WeatherTech SportsCar Championship, the race has had several names over the years. Since 1991, the Rolex Watch Co. is the sponsor of the race under a naming rights arrangement. Winning drivers of all classes receive a steel Rolex Daytona watch, in 2006, the race moved one week earlier into January to prevent a clash with the Super Bowl, which had in turn moved one week into February a few years earlier. The race has been known historically as a leg of the informal Triple Crown of endurance racing, shortly after the track opened, on April 5,1959, a six-hour/1000 kilometer USAC-FIA sports car race was held on the road course. Count Antonio Von Dory and Roberto Mieres won the race in a Porsche, the race utilized a 3. 81-mile layout, running counter-clockwise. In 1962, a few years after the track was built, known as the Daytona Continental, it counted towards the FIAs new International Championship for GT Manufacturers. 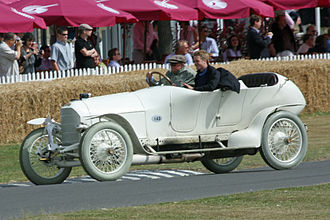 The first Continental was won by Dan Gurney, driving a 2. 7L Coventry Climax-powered Lotus 19. Gurney was a factory Porsche driver at the time, but the 1600-cc Porsche 718 was considered too small, in 1964, the event was expanded to 2,000 km, doubling the classic 1000 km distance of races at Nürburgring and Monza. Starting in 1966, the Daytona race was extended to the same 24-hour length as Le Mans, unlike the Le Mans event, the Daytona race is conducted entirely over a closed course within the speedway arena without the use of any public streets. Most parts of the steep banking are included, interrupted with a chicane on the back straight, unlike Le Mans, the race is held in wintertime, when nights are at their longest. There are lights installed around the circuit for racing, although the infield section is still not as well-lit as the main oval. 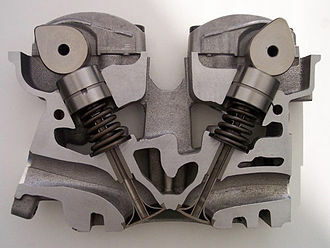 VW Solex carburetor as used on Aircooled Beetles from 1970 onwards.